When Adam Blum was asked to join the Chancellor's Centurions, he didn't hesitate. "Working with and leading with my peers is important work," he says. "We are the future." By any measure, Adam Blum is the kind of benefactor that institutions like The University of Texas at Austin dream of. A faithful Longhorn (he earned his BBA and MPA in 2006), Adam’s loyalty to his alma mater was steadfast throughout his years as a student. He never missed a Longhorn football game—whether played at home or away. As a student in the McCombs School of Business, he created and taught the “Advanced Topics in Financial Reporting” course, which is still available to students. Upon graduation, he continued his involvement as a lecturer, mentor and volunteer in the business school. 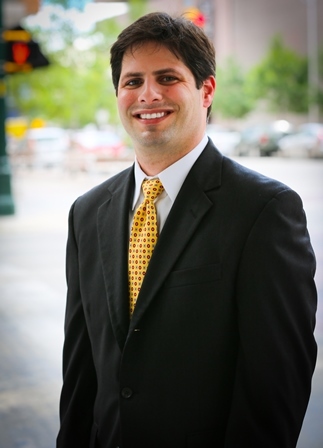 Today, Adam serves on the Longhorn Foundation Board and BBA advisory board. His generous financial contributions to those entities secured him a spot in the Chancellor’s Council, and he was one of the first alums to be asked to become a Chancellor’s Centurion. Adam’s approach worked. He made sound investments and lifelong friends. In 2008, news of his successes drifted southward and Adam was recruited by Austin Ventures to be a conduit for arranging financing for new and growing local businesses. Then, in 2011, Adam took a big leap and went out on his own. Among the issues that captures Adam’s attention and philanthropy is public higher education in Texas, which is why he is an ardent supporter of both UT Austin and the UT System. “It’s my duty as a Texan to support the institutions of Texas.” In doing so, he adds, he and others can help to minimize the gap that exists between the public funds allocated for and the actual cost of running a system of universities and health care institutions. “We can’t always raise tuition, so we need to increase philanthropy,” Adam asserts.